March 11, 2015 – From Dallas to Downton Abbey, our national sense of culture and identity has long and repeatedly been exposed to outside exposure and influence. In spite of this, most consider Canadian culture to be unique, worthy of, and, critically in need of protection to survive. Those views go some way to explaining why Canadians also hold generally favourable views towards two major Canadian cultural institutions: the Canadian Broadcasting Corporation (CBC) and the Canadian Radio-television and Telecommunications Commission (CRTC). These are the findings of a recent comprehensive national survey of 1525 Canadians undertaken by the Angus Reid Institute. The majority of Canadians (80%) hold an overall favourable view of the CBC. A deeper look reveals the CBC is held in highest esteem by its most engaged audience, while those who are more casual consumers of CBC content are much more ambivalent about the broadcaster. Fully half of Canadians substantially over-estimate what CBC costs taxpayers on a per capita basis, and there is a lack of consensus on whether current funding levels are adequate: almost half (45%) think so, but those remaining are more likely to describe the broadcaster’s funding as too low rather than too generous (32% versus 23% respectively). Canadians are concerned about recent news stories concerning the CBC: 55 per cent voiced concern about the Jian Ghomeshi story and 52 per cent about the CBC’s loss of Hockey Night in Canada to Rogers; there was slightly less concern (and lower awareness) about CBC personalities taking speaking fees from organizations in the news (42% concerned). Canadians also express overall favourable views of the CRTC (64%). There is a fair degree of uncertainty and some negativity regarding some elements of the CRTC’s mandate and performance; the CRTC ‘s marks are somewhat lower on key consumer protection fronts than in content-related areas. As for the CRTC’s perceived relevance, one-in-four (24%) of the Canadians surveyed said they believe it is “more relevant than ever” and another four-in-ten (39%, the plurality) said it is “as relevant as it used to be”. But, most Canadians also do not see a regulatory role for online media (56%, rising to two-thirds of young people) and, relatedly, most see declining relevance for the CRTC in the coming decade (almost seven-in-ten). There is a strong view that this culture is “something special”. Asked to describe their overall feelings regarding Canadian culture on a 10-point scale where “1 means basically boring” and “10 means something special”, the Canadians surveyed gave an overall average rating of 7.4. One-in-three (30%) gave an enthusiastic 9 or 10 rating, and another four-in-ten (44%) opted for a 7 or 8. Fewer than one-in-ten (7%), meanwhile, gave Canadian culture a “thumbs down” rating of below 5. These overall positive views of Canadian culture are noted among Canadians from all walks of life – including across generations, education and income strata, and by political orientation. Views are slightly less enthusiastic among Quebecers than elsewhere in Canada, though most Quebecers agreed Canadian culture is unique and most assigned a rating of 7 or higher on the boring versus special scale. Canadians also believe the nation’s culture needs programs and policies to ensure its continued survival. Asked to imagine we did not have cultural promotion policies and instead treated foreign cultural products the same as Canadian, just about half (47%) of those surveyed said this would result in Canadian culture being “completely swallowed up by American and foreign culture”, and another 37 per cent said it would be “weakened but still survive okay”. Only one-in-six (16%) Canadians surveyed said “Canadian culture would be fine without government protection”. The concern that Canadian culture would be “swallowed up” in the absence of protective policies is most widespread in Quebec and BC, and among women. Large differences are noted across political stripes: on the overall point-of-view question, Liberal and NDP supporters opted for Canadian culture needing protection by a factor of four-to-one, whereas Conservative supporters were evenly split on this overall question. These findings indicate those who most consider Canadian culture to be unique and special tend to be stronger advocates of the need for protection policies to ensure its survival. The relationship is not massive but it is there, and is an important underlying element of the public opinion landscape. These current results show little change on this fundamental measure over the past 20 years or more. Then, as now, views differ sharply within and outside Quebec, though a narrow plurality of 42 percent of Quebecers now opt for a deep attachment to Canada. The generational pattern will be disturbing for Canadian nationalists: whereas three-quarters of Canadians over 35 profess a deep attachment to Canada, only half of their younger counterparts chose this most patriotic characterization. Notably, there is a very strong relationship between attachment to Canada and assessment of its culture. Specifically, those professing the highest level of attachment are almost unanimous in their view that Canada has a unique culture (84% take this view) and that it is “something special” (86% chose a 7 or higher on that scale). Interestingly, views on the need to protect that culture do not show nearly as much variance by responses to the attachment measure. Fully four-in-five (80%) Canadians surveyed expressed a favourable view of their public broadcaster – 21 per cent reported a “very favourable” view, while 59 per cent opted for a generally favourable characterization. This leaves only one-in-five (20%) nationally who voiced an unfavourable view of the CBC (4% opted for “very unfavourable”). There are some important differences in the CBC’s overall favourability ratings across key population groups (patterns which largely hold consistent on the various other aspects assessed in this survey). Across English-speaking Canada, three quarters (77%) expressed overall favourable views (18% opted for very favourable). Overall favourable views were as high as 87 per cent in Atlantic Canada and dipped to just over 70 per cent in Alberta and Saskatchewan. Across generations, slightly higher numbers of older (55+) Canadians report “very favourable” views of the CBC compared to their younger counterparts. Women tend to give higher overall favourability ratings to the CBC than men. Looking across educational strata, the survey results (on this and other questions) show university-educated Canadians are much more likely than those with less formal education to give a “very” favourable rating to the public broadcaster (33% versus 15%). Political orientation is strongly related to views of the CBC. Specifically, supporters of the opposition Liberals and New Democrats are more intensely favourable towards the CBC than those who supported the Conservatives in the last federal election. Among Conservatives, two-in-three still give the CBC overall favourable ratings but the one-in-three unfavourable represents almost three times the number of critics found among opposition party supporters. Lastly, Canadians’ overall appraisal of the CBC is impacted by their assessment of the necessity of cultural protection: specifically, those who take the view that the culture needs protection to survive hold much more favourable views of the CBC than those who do not see a need for cultural protection. The Angus Reid Institute asked Canadians how often they access CBC programming and information. Fully 58 per cent of the Canadians surveyed said they tune into CBC TV news and information at least once a week or more; one-in-three (31%) do so every day (17%) or almost every day (14%). Almost as many (50%) said they tune in as frequently to other, non-info CBC TV offerings; one-in-five (19%) do so every day or almost every day. There’s a drop-off as we turn to CBC sports. A total of one-in-three (30%) Canadians surveyed said they tune into this once a week or more often (only one-in-twenty on an almost daily basis). CBC radio news and info programming is at least a weekly staple for one-in-three (31%) Canadians; almost one-in-five (17%) tune in to CBC radio news daily or almost every day. Other CBC radio is tuned into by one-in-four (25%) Canadians weekly or more, by one-in-ten daily or almost daily. A large number (43%) say they “never” tune in to non-news CBC radio. Lastly, in the case of CBC online, one-in-four (28%) Canadians surveyed reporting checking in once a week or more, half of them (14%) almost daily or more. The Angus Reid Institute created an overall “CBC engagement index” in order to provide a quick profile of who comprises the public broadcaster’s most committed viewers/listeners and who, on the other hand, is turning away and tuning out. This is an aggregate assessment; readers interested in the audiences for the six specific CBC offerings summarized above are invited to examine the detailed tables at the end of this release. The “CBC devotees”. This most heavily engaged group includes one-in-five Canadians (18%). This audience segment scores between 310 and the maximum 480 on the index, with the median score at the 360 mark; which would translate into consuming all six CBC offerings two to three times a week (or some less often and some more often than that, but obviously tilting to heavy usage). The “CBC committed” include one-in-four Canadians (24%). These people (with index scores from 210 to 300) are quite frequent consumers of several of the CBC offerings and/or heavy users of two or three. The “CBC Crowd”. This is the largest group, with 32 per cent of respondents landing here. Scoring from 110 to 200 on the index, the crowd tunes in perhaps monthly or so to several CBC offerings or is a heavier user of one or two (or some combination of these broad scenarios). The “CBC casual audience”. This last segment is much less engaged with CBC. Roughly one-in-four (23%) Canadians surveyed are included here, having scored between 10 and 100 (of the possible 480) on the index. This would mean this casual audience tunes infrequently to a few different CBC offerings or perhaps uses one (and only one) more heavily. So, who is tuning into CBC? 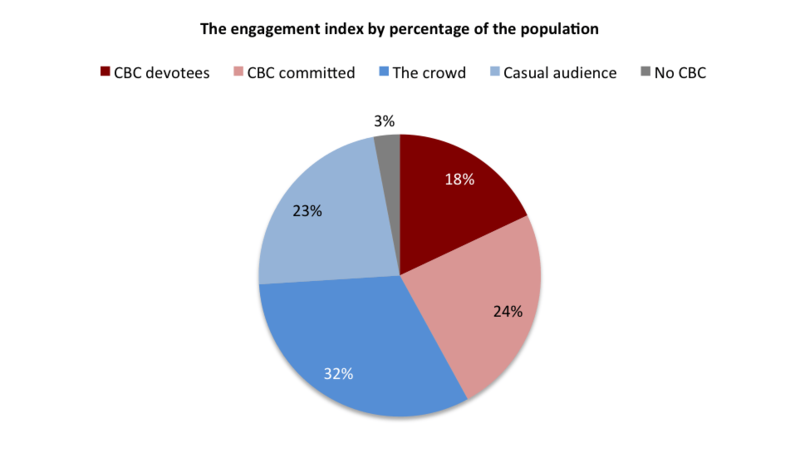 The CBC engagement index gives us the following insights into the socio-demographic profile of its overall audience. Regarding gender, CBC engagement appears quite similar overall. Women are slightly more likely to be in the casual group (26% versus 19%) whereas men are slightly more likely to rank as devotees (20% versus 16%). Some of the biggest differences are noted generationally — and not in a direction that will comfort friends of public broadcasting. Among Canadians under 35 years of age, fully two-in-three land in the casual grouping or in the crowd, and only one-in-three rank as CBC committed (19%) or CBC devotees (12%). 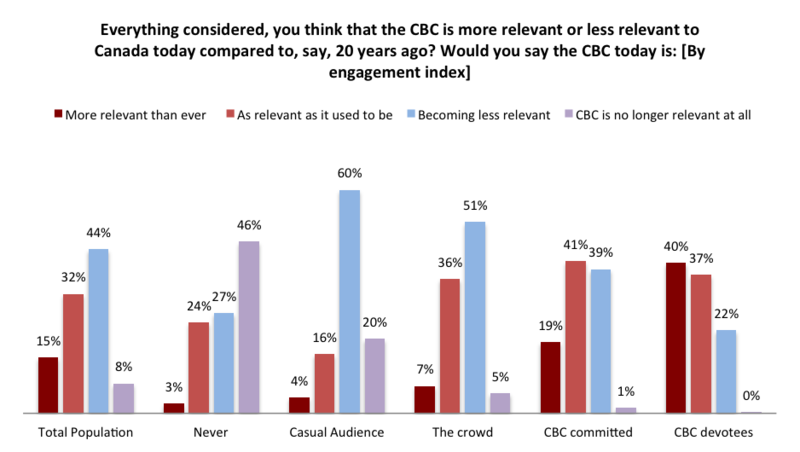 Middle-aged and older Canadians, meanwhile, are much more likely to rank as CBC devotees (17% and 24% respectively) and also as committed (24% and 30%); indeed, a full majority of Canadians over 55 are in the two highest engagement segments: 54% versus 41% of those in the middle age grouping and only 31% of younger Canadians. There are also very large differences in CBC engagement noted across educational strata. Among the university-educated, just about half land in the devotee (28%) or committed (20%) groups. Those who did not go to high school are much less likely to be in these highly engaged segments; only 12 per cent score as devotees, for example. Differences are not nearly as marked across income strata. Political orientation plays a major role in engagement with the CBC – specifically, supporters of the Conservatives are much less engaged then opposition party supporters. For example, only 10 per cent of Conservatives score as CBC devotees compared to roughly three times as many opposition party supporters. Likewise, Conservatives are twice as likely as opposition party supporters to be ranked as only casual CBC viewers (27% versus 14%). Lastly, with respect to broader views on Canadian culture, the survey results show a strong relationship: Those who see Canadian culture as unique and something special and as requiring protective measures are much more likely to be highly engaged with the CBC’s various offerings and therefore to be found in the CBC committed and devotee segments. On the other hand, a disproportionate number of Canadians who believe the culture does not require special protection are found in the less engaged segments. In the case of the CBC it appears that to know them is to love them. Those Canadians most engaged – the heaviest consumers of CBC’s offerings – have a much more favourable orientation towards the public broadcaster. In terms of overall favourability, four-in-five of all Canadians give CBC a favourable rating, one-in-five opt for very favourable. This latter figure is 53 per cent among CBC’s devotees, and another 46 per cent indicate generally favourable views – so the overall verdict among the most highly engaged is essentially unanimously favourable. The CBC committed are 93 per cent favourable overall and 27 per cent are “very favourable”. This positive rating falls off among “the crowd” – still 81 per cent positive but only 11 per cent very positive. The casuals, the lightest CBC consumers, are almost split in their overall opinion of CBC (56% to 44% unfavourable). As we will see in some of our subsequent analysis of the survey findings, levels of engagement also impact other aspects of Canadians’ assessment and points of view on the CBC and some of the current challenges it faces. The Jian Ghomeshi sexual harassment scandal: This is a source of significant concern for the Canadian public. Fifty-five per cent of all those surveyed said they were very (29%) or somewhat (26%) concerned by the Ghomeshi scandal. This compares to 35 per cent who are not very or not at all concerned by this story. Ten per cent of Canadians indicated they had not heard anything about this. CBC losing the broadcasting rights to Hockey Night in Canada (HNIC) to Rogers Sportsnet: The CBC losing HNIC to Rogers is also cause for concern for many Canadians: fully 52 per cent of those surveyed said they are very (24%) or somewhat (28%) concerned by this news. Meanwhile, one-in-three (35%) of those polled said they were not very or not at all concerned about the CBC losing HNIC. One-in-ten (12%) had not heard anything about this. Prominent CBC news personalities (including Peter Mansbridge and Amanda Lang) accepting speaking fees from companies, organizations and industries they may be covering: The revelation that CBC personalities had accepted speaking fees from organizations in the news has caused somewhat less public concern. A total of 42 per cent of Canadian surveyed said they were very or somewhat (16% and 26% respectively) concerned by the speaking fee revelations while almost as many (37%) said they were not concerned about this. One-in-five Canadians surveyed said they had not heard anything about this. For all three of these CBC news developments, this Angus Reid Institute survey finds levels of concern and levels of awareness consistently much lower within Quebec than elsewhere in the country. Indeed, for each of the three, Quebecers were roughly twice as likely as other Canadians to indicate they had not heard of these news stories, and they also voiced much lower levels of concern (in the range of 20 percentage points lower). The results also show consistently higher levels of concern about these stories among university-educated Canadians, and those living in higher income households. We also see men expressing more concern about the speaking fees revelations, and older Canadians voicing more concern about the Ghomeshi scandal. (But consistent response patterns by gender and age for the other two news stories respectively). For each of the three new stories, levels of concern rise steadily with higher levels of CBC engagement. Lastly, by views of the CBC, those more favourably disposed overall were relatively more bothered by the move of HNIC and less by the speaking fee revelations, which are of greater concern to those with an already unfavourable disposition towards CBC. In recent years, the CBC says it has had to make big changes to “match its services and its footprint” to changing realities chief among them, reduced funding. CBC has been coping with budget reductions estimated (on CBC’s own website) at a cumulative $390 million since 2009. The parliamentary operating grant itself has shrunk from over $1.2 billion a few years ago to $960 million this year. Government funding for the CBC is augmented with the corporation’s advertising and other revenue, also under some pressure. One-in-four (26%) chose the correct range of $20-$50. The same number (26%) pegged CBC funding at lower than it is ($20 or less per capita). That leaves half of Canadians who think the CBC is substantially more expensive for taxpayers than it actually is. Fourteen per cent chose between $50 and $100 per capita; 17 per cent chose between $100 and $200. Higher still, 10 per cent guessed the subsidy to be somewhere between $200 and $500; and another one-in-ten (8%) placed it over $500 per capita. Those latter two groups total to one-in-five (18%) who estimated the CBC’s direct federal support works out to $200 or more per capita — exponentially more than the actual figure of just under $28. CBC supporters have long and loudly decried the decline in public funding for the public broadcaster and many have been urging for more generous funding back in what now might be called the CBC’s “good old days”. In the United Kingdom, The CBC’s equivalent, the British Broadcasting Corporation (BBC) is held up as the new gold standard with growing audiences and critical acclaim, at home and internationally. The BBC’s per capita funding (raised via TV licensing, not a direct grant) is over $100 per capita and, as CBC supporters point out, the BBC has some major advantages and economies of scale, including: twice the population, one language and a single time zone. So, do Canadians see the CBC’s federal government funding as adequate? Informed that it equals roughly $28 per capita and asked for their overall view of this funding level, almost half (45%) of the Canadians surveyed described it as “about right”. One-in-three (32%), however, voiced concern that this is “too low, the CBC needs more money to play its role properly”, leaving one-in-four (23%) Canadians who take the view that federal government funding for the CBC is “overly generous, they should have to make do with less money”. Some of the biggest differences are noted by Canadians’ levels of engagement with the CBC. The devotees are quite convinced the CBC is underfunded (60% of this high user segment takes this view). Many of the “committed” share this opinion as well. But the broader “crowd” with its average engagement with CBC’s offerings reflects the overall view that the funding level is “about right”. More “casual” CBC viewers/listeners are as likely to tilt towards the view that the public broadcaster’s funding is overly generous. Likewise, in terms of overall favourability of the CBC, the results show its biggest admirers (those who expressed a “very favourable” view) very much believe the CBC needs more money to perform its role whereas CBC’s detractors are almost as convinced it should get by with less money. Regionally, a plurality everywhere went for “about right” to describe the CBC’s funding, but the perception that it is overly generous is more popular across Western Canada, whereas Quebecers are much more likely to describe SRC funding as “too low”. And finally, we see very strong differences of opinion by political party orientation. Fully four-in-ten Conservative supporters view federal government funding of the CBC as “overly generous” versus only one-in-ten of this group who see the funding as “too low”. Among opposition party supporters it is the reverse with almost half (the plurality) viewing the CBC as underfunded to properly perform its role and only one-in-ten taking the view that the broadcaster should have to make do with less money. Canadians are roughly evenly divided on the question of whether the CBC is maintaining its relevance. Asked if they think the public broadcaster is more or less relevant to Canada than it was 20 years ago, just under half (48%) of the Canadians surveyed said they believe it is “more relevant than ever” (15% chose this strong characterization) or “as relevant as it used to be” (32%). But the other half (52%) see the CBC as a less relevant institution: a plurality of 44 per cent took the view that the CBC is “becoming less relevant” while almost one-in-ten (8%) said they believe “the CBC is no longer relevant at all”. Again, some of the biggest differences in perspectives are noted between Quebecers and other Canadians: fully six-in-ten (62%) Quebecers assess CBC/SRC to be as or more relevant than ever compared to four-in-ten (43%) Canadians in other regions of the country where the prevailing view is that CBC’s relevance is declining (or no longer). Across generations and educational strata, we see the same broad split in overall views, but a closer look shows older Canadians and those with the most formal education are considerably more likely than others to see the public broadcaster as “more relevant than ever”. As seen on virtually all other aspects examined, supporters of the Conservatives are more tepid in their views of the CBC: in this case, by a margin of two-to-one, Conservatives see the CBC’s relevance as declining whereas their counterparts supporting one of the main opposition parties tilt towards the CBC being of continued relevance. Again, engagement with the CBC is a huge factor. The “devotees” who most heavily consume the CBC’s offerings see the broadcaster’s continuing relevance — three-quarters (77%) took this view, as did almost two-in-three (60%) of the next most committed group. The “crowd” tends to reflect the assessment measured among Canadians as a whole, and the casual, much lighter users of the CBC very much see its relevance in decline. Lastly, the CBC’s perceived relevance varies by views of the necessity of cultural protection – though perhaps not to the degree that might be expected given this variable’s pull on other measures. Those most convinced of the necessity of cultural protection are overall roughly split on whether the CBC is holding or losing its relevance, whereas those who believe Canadian culture would be fine without protective measures tend to see the CBC as losing relevance. Canadians express overall favourable views of the CRTC, though with very little intensity of feeling at either end of the spectrum. Asked to describe their overall feelings of the organization, almost two-thirds (64%) of the Canadians surveyed opted for “favourable”, though only a fraction (4% of the total) characterized their view as “very favourable”. This leaves just over one-in-three Canadians (36%) reporting “unfavourable” views of the CRTC, but again only a fraction (5% of the total) described their view as “very unfavourable”. The CRTC finds its strongest favourability ratings among Quebecers — 75 percent. Views are somewhat more lukewarm elsewhere in the country, particularly in BC and Ontario (where we see less than a 20 point gap in the proportion favourable versus unfavourable). Overall, perceptions of the CRTC do not vary greatly along generational lines or across educational or income strata. We do see something of a gender gap with higher favourability ratings offered by women (70% versus 58% of men). Political orientation definitely impacts. Conservative Party supporters were only narrowly positive in their overall view of the CRTC (56% versus 44%) whereas the favourability gap is over 20 points in the case of NDP supporters (62% versus 38%) and over 30 points for Liberals (68% versus 32%). Views on cultural protection factor in Canadians’ appraisal of the CRTC: those who see protective measures as essential for Canadian culture’s survival endorse the CRTC overall (71% favourable. Those who take the view that the culture would survive without protection tilt towards an unfavourable view of the CRTC (54% unfavourable). Canadians overall have only some familiarity with the CRTC and what it does. One-in-ten (8%) said they are “very familiar, have read and thought about it” and another one-in-three (36%) described themselves as “fairly familiar” with the CRTC. Against this total of 44 percent professing a good degree of familiarity there are 55 percent who said they are “not very familiar, just the main purpose” (43%) or “not at all familiar with the CRTC” (12%). Reported familiarity with the CRTC increases rather sharply along educational strata from 35 percent of those who have not gone beyond high school rising to 55 percent of Canadians with a complete degree. The survey results also show a fairly wide gender gap in reported familiarity (only 32% of women versus 58% of men). There is also a generational skew with familiarity lower among Canadians under 35 (37%, bumping up to 48% among those over 35). There is a relationship between familiarity and favourability: those very familiar with the CRTC were evenly split in their overall views of the agency versus an almost two-to-one favourable split among those less familiar; those most familiar are also more likely than others to place themselves at the “very” ends of the favourability scales. This Angus Reid Institute poll examined public perceptions of the overall mandate of the CRTC. Specifically, Canadians were asked to prioritize six specific areas of agency focus and to provide an assessment of the CRTC’s performance on each. Three of these areas deal with the CRTC’s “content-oriented” objectives while the other three concern their “consumer protection” role. The results of this line of inquiry are summarized below. Canadians attach a high priority to CRTC’s mandate to ensure a local broadcast presence in Canadian communities: 54 percent ranked this as number one (18%), two (19%) or three (17%) from the six assessed. The CRTC gets solid marks for its performance on this front with a full majority (53%) saying they do a “good job” in this area against only 26 percent who say they do a “poor job” (21% were unsure). As for the famous Canadian content or “Can-con” requirements, this Angus Reid Institute survey finds Canadians attach considerable importance to this area with half tagging it as one of the top three priorities of our list of six (22% ranked it first, the highest of any, 15% ranked it second and 13% ranked it third). And, the CRTC gets positive grades on this count: 58 percent of Canadians surveyed gave it good marks here versus 21 percent who said the CRTC does a poor job on the “Can-con” front. This content-focused area was rated as the lowest of the six priorities: 40 per cent put it in the top three, only 13 percent ranked it as first of the six. Canadians give the CRTC fairly good marks here, with 41 percent saying they do a good job against 23 percent who say they do a poor job. Thirty-six percent of Canadians surveyed were unsure, reflecting lower awareness of this aspect of the CRTC’s mandate. Regulating cell phone companies’ billing practices emerged as one of the top priorities of the six assessed, with a total of 57 percent of those surveyed selecting this as the first (18%), second (21%) or third (18%) most important priority from the list. In this important area, Canadian consumers offer a split opinion on the CRTC’s performance of this role: 38 percent said the CRTC is doing a “good job” in this area (only 4% said very good) while 42 percent gave the CRTC poor marks. Sixteen per cent said they do a “very poor job” in this area. As in all of the focus areas assessed, a fairly large number of Canadians could not offer an assessment of the CRTC’s performance (20% in this case). This regulatory function also ranked as a high priority, with a total of 55 percent of Canadians surveyed ranking it first (17%), second (19%) or third (19%) of the six mandate areas assessed. Forty-four per cent said the CRTC has done a poor job in this area (15% opted for very poor) compared to 33 percent who said they are doing a good job. Almost one-in-four (23%) could not assess. This consumer protection area ranks as a slightly lower CRTC priority for Canadians (47% put it in the top three; 13% as first). And again, Canadian consumers tilt negatively in their assessment of how good a job the CRTC does protecting them from unsolicited communications: 46 percent said they do a poor job here versus 35 percent who said they think the CRTC does a good job protecting consumers in this regard. Nineteen per cent were unsure. Most Canadians continue to see the CRTC as retaining its relevance. Asked if they think the agency is more or less relevant to Canada than it was 20 years ago, one-in-four (24%) of the Canadians surveyed said they believe it is “more relevant than ever” and another four-in-ten (40%, the plurality) said it is “as relevant as it used to be”. This leaves one-in-three (31%) who took the view that the CRTC is “becoming less relevant” while only one-in-twenty (6%) said they believe “the CRTC is no longer relevant at all”. Views on the CRTC’s current relevance are fairly consistent across the main population groupings. Generationally, younger people are somewhat more likely to believe the CRTC is holding its relevance while those over 35 are somewhat more likely to see its relevance as declining. Across educational strata, it is those with a complete university degree who are most likely to see the CRTC as “more relevant than ever” – almost one-in-three of this group take this view. As seen on other questions, supporters of the Conservatives are somewhat more tepid in their views of the CRTC, while opposition party supporters attach greater relevance to it. Again, familiarity with the CRTC is a factor. Those who described themselves as very familiar with the CRTC are more likely than those less familiar to take views at both ends of the spectrum: 34 percent said “more relevant than ever” (versus the 24% overall) but 18 percent said “no longer relevant at all” (versus only 6% overall). And the CRTC’s perceived relevance varies by views on the necessity of cultural protection – those most convinced of its necessity attach higher relevance to the CRTC. Back in 1968 when the CRTC came into being, the advent of online media was obviously not on anyone’s radar. Indeed, the arrival and rapid proliferation of television in the decade prior was nothing short of revolutionary in its own right, and has posed a major regulatory challenge from the get-go. Now, we’ve gone beyond the 200 channel universe and into the ether with the exploding possibilities offered by cultural offerings delivered via the internet. The attendance of video on-demand service Netflix at recent CRTC hearings offers perhaps some foreshadowing that this may be difficult territory for the CRTC to navigate. This is a contentious subject, but at this point Canadian public opinion already tilts away from a traditional CRTC role where online media is concerned. Asked for their broad view of the CRTC’s role here, a majority of 56 percent of Canadians surveyed took the view that: “Online media should not be subject to the same types of CRTC regulations as traditional media” while a large minority of 44 percent took the opposing view that “The CRTC should regulate online media in the same way it regulates traditional media”. Above all, as would be expected, views diverge sharply by people’s general disposition on the need for cultural protection. Those who see a need are essentially evenly divided as to whether or not the CRTC’s regulatory role should encompass online media; those who don’t consider cultural protection to be necessary decidedly want the CRTC to leave this area alone. Views also differ markedly across generations. By a margin of two to one (67% to 33%), Canadians under 35, obviously the heaviest consumers of new media, do not believe it should be subject to traditional CRTC regulation. This is also the prevailing view of those in the middle 35-54 group. Canadians over 55, meanwhile, tend towards the opposing view with 56 per cent saying the CRTC should regulate online media in the same way as traditional. Regional differences are also strong. Once again, it is Quebecers who are the biggest boosters of a strong role for the CRTC – a majority (54%) of Quebecers surveyed opted for CRTC regulation of new media. Elsewhere, most (60%) Canadians take the opposite view and do not see a regulatory role for the CRTC when it comes to online media (one exception being the Atlantic region where those polled were evenly split). Views do not differ markedly across educational strata. But by income levels, we see higher support for “hands off” as income increase. Lastly, looking at the results by political orientation shows Conservative party supporters most convinced that online media should not be subject to CRTC regulation (63% versus 37%) whereas opposition party supporters are almost evenly split on this overall question. And so, Canadians’ outlook for the CRTC’s relevance a decade hence is not as solid. Asked for their overall forecast on this question, a slim majority of 52 percent of Canadians said they think the CRTC will “still be important, but declining” a decade from now. Only half as many (28%) tilted towards the CRTC “continuing to play an important role in Canadian culture”, while one-in-five (20%) took the view that the CRTC will be “basically irrelevant” a decade from now.